Home > PRODUCTS>REMOTE LAUNCHERS>Transmitter RR Deluxe. 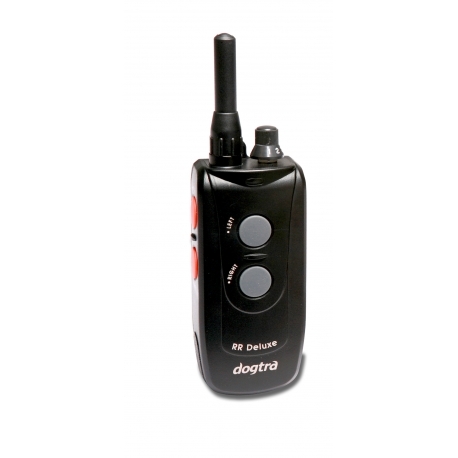 Dogtra RR DELUXE transmitter. Remote release system for bird launchers QL and PL. The Dogtra RR Deluxe is designed to operate the Dogtra PL and QL Launchers for training pointing dogs. It is also compatible with most bird/bumper launcher systems on the market today. The long range assures activation at the most demanding ranges. Our realistic duck call attention getter makes the RR Deluxe the release of choice for serious retriever trainers looking to enhance their dogs' marking ability for the hunting season or for Field Trial competitions. The unit also has a beeper horn for identifying the location when being used for upland work with our PL or QL Launchers. The RR Deluxe is user expandable and can operate up to 8 launchers.